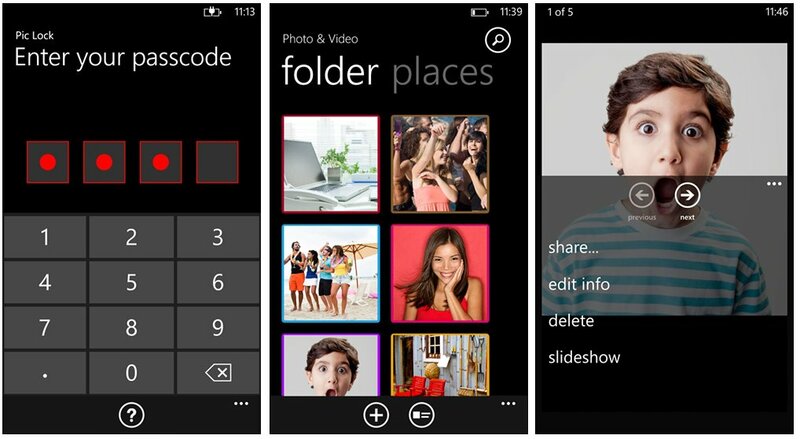 Pic Lock Ultimate is a feature rich photography app for your Windows Phone 8 device that keeps your photos and videos secure from prying eyes. Pic Lock Ultimate uses a four digit or alphanumeric passcodes, has an anti-intruder system, and a panic warp system to quickly exit the app. Pic Lock is one of the more creative photo/video vaults we've seen but has a few issues that really needs to be ironed out before Pic Lock Ultimate can shine. When you first launch Pic Lock Ultimate you have to set your passcode (default setting is for a four digit passcode) and a reminder. From there you have an Apps, Favorites and Quick Add page. The Apps page is where you create folders and import images from your camera roll, the Favorites is where you can pull up photos based on keyword tags that you can add to your images. The security system for Pic Lock Ultimate is rather interesting. Obviously your images and videos are secure by passcode but you also have a surveillance/anti-intruder system that can be turned on in the settings that will activate your front facing camera when access is attempted. If the wrong passcode is entered, a picture will be taken of your intruder. If the wrong passcode is entered three times, the video kicks in. 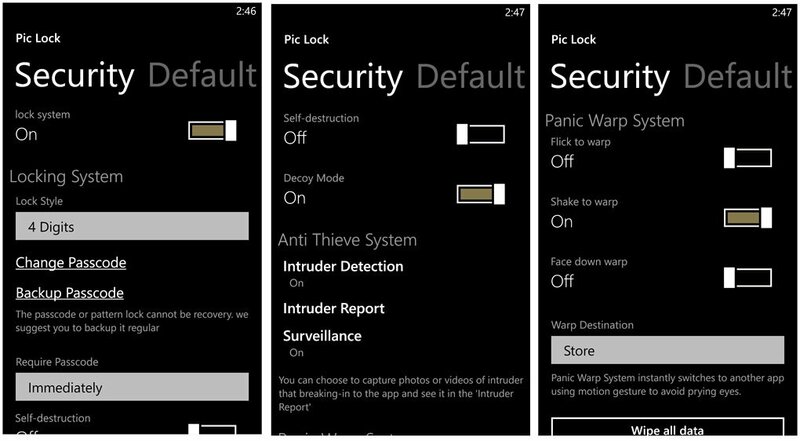 You can review your intruder footage from Pic Lock Ultimate's settings to see who's been messing with your Windows Phone. The ultimate intruder protection comes with the Self-Destruction setting. If active and there are five incorrect passcode entries, all data in the Pic Lock app will be deleted. There is one additional security oriented feature that is on the neat side. 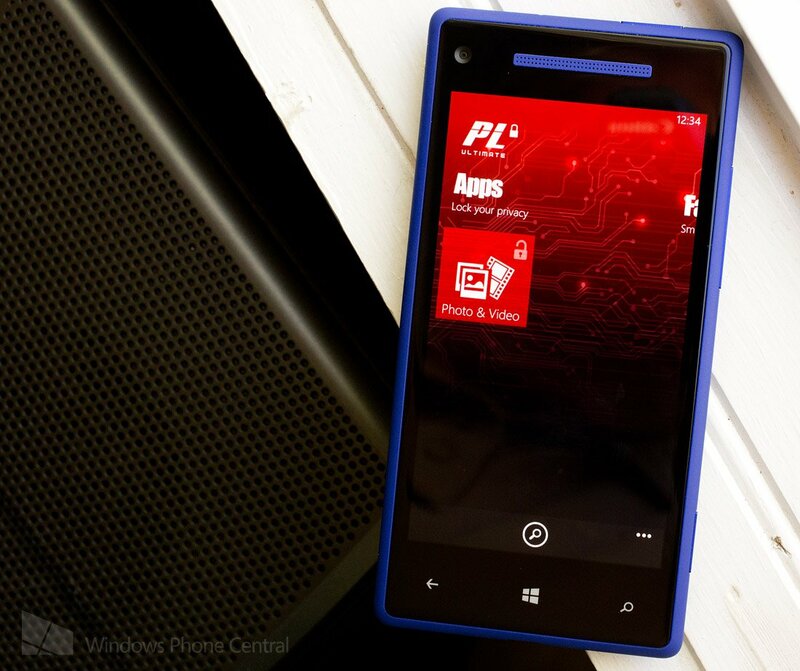 The Panic Warp System will allow you to shake, flip or set you Windows Phone face down to send your phone to either the Windows Phone Store or Internet Explorer. So if your browsing through your photos and sense someone is looking over your shoulder, just shake your phone to pull up the Store. While the security aspects of Pic Lock Ultimate stand out, the app isn't too shy on features for managing your photos. You can create folders, share images, and the app also has Skydrive support. Pic Lock Ultimate is a feature rich photography app but two issues are present that really holds this app back. First, there isn't a trial version available. This turns a lot of Windows Phone users away who want to see what an app or game can do before purchasing. The other issue is that in testing out Pic Lock Ultimate I was not able to import photos from my Pictures Hub. I could create a folder, give it a custom color highlight, and could see the various folders in my Pictures Hub. On the Nokia Lumia 920, when I opened any of the folder all I would get was a blank screen. On the HTC 8x, I could import images from the Saved Pictures folder but the Camera Roll delivered the same blank screen. I was able to add new photos to Pic Lock Ultimate by using the camera app but importing was not possible. There isn't an option to share the photos to Pic Lock from within the Pictures Hub either. Hopefully this bug will be addressed quickly because Pic Lock Ultimate makes a very nice first impression. We'll reach out to the developer and monitor things and we'll keep you updated on any fixes pushed out. In the meantime, if you want to give Pic Lock Ultimate a try, it's currently running $.99 and you can find it here in the Windows Phone Store.